For certain movies, placement in the Discovery section of the Toronto International Film Festival almost seems like a plea. The festival catalogue calls the program “your introduction to gifted and innovative directors who are certain to become household names,” but that’s assuming those directors actually get discovered. Some of this year’s Discovery films have already achieved that hefty goal and found a fair amount of support — from distributors, at least. Prior to Toronto, IFC Films picked up U.S. theatrical rights to “Medicine for Melancholy,” Barry Jenkins‘ bittersweet tale of hipster love and gentrification woes in San Francisco, and the popular Cannes entry “Hunger,” a tense prison drama that brought first-time director Steve McQueen the Camera D’Or. Whether or not these movies manage to find their audiences in theaters remains to be seen, but the confidence they’re provided by the promise of a release bucks the problem of whether or not the Discovery section might relegate them, at least temporarily, to an obscure region of the festival. Meanwhile, the elderly romance “Lovely, Still” will certainly find distribution and even a sizable audience due to its renowned leads, Martin Landau and Ellen Burstyn. Other Discovery titles seem too rarified for anyone to pay attention beyond highly specialized audiences: “Tony Manero,” a surprisingly tense, hilariously eccentric thriller about a crazed “Saturday Night Fever” fan living under Augosto Pinochet‘s dictatorship in Santiago de Chile thirty years ago, contains a visceral edge that miraculously works in harmony with the goofy pop culture content. But outside of South American history buffs, “Fever” fans and diehard genre types, the appeal of “Tony Manero” runs thin. Another Discovery film, “Delta,” from Hungarian filmmaker Kornel Mundruczo, utilizes fantastic cinematographic nuances in its depiction of a quiet traveler (Felix Lajko) visiting his birth town and uncovering corruption in the shadows, but Carlos Reygadas‘ “Silent Light” did that, too, and has since faded into oblivion. A similar problem, worsened by blatant quality issues, plagues the animated feature “$9.99,” an Australian adaptation of several short stories by Israeli writer Etgar Keret. Fans of Keret’s stories will surely want to add this one to their list of must-sees alongside the Keret adaptations “Wristcutters: A Love Story,” and “Jellyfish.” The meticulous claymation design of “$9.99” suits Keret’s tendency toward magic realism, and that alone makes it superior to the aforementioned earlier films. However, writer-director Tatia Rosenthal‘s script, which centers on a troubled elderly man and his two sons living in downtown apartment, frequently slows down for quiet discourse that runs against the appealing visual design. The occasional bright spots, such as the sequences in which a troubled young man living down the hall from the family smokes pot with a gang of inexplicably miniature people, lose their hold on the audience each time another existential monologue crawls into the picture. 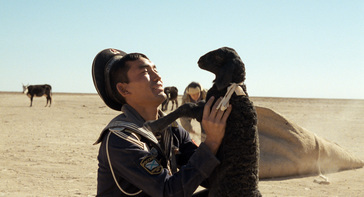 A scene from Sergey Dvortsevoy’s “Tulpan.” Image courtesy of the Toronto International Film Festival. More promising in terms of filmmaking talent and mainstream appeal, several Discovery entries deal with vastly different coming-of-age narratives from around the world. “Tulpan,” a gorgeous visit to the wilderness of Kazakhstan that screens along with “Tony Manero” at the New York Film Festival later this month, follows a young man named Asa, who leaves his job as a sailor to visit his nomadic family five hundred kilometers from the nearest town. Set in a desolate landscape where sheep give birth more often than people, the lyrical design of “Tulpan,” subtly directed by Sergey Dvortsevoy, recalls “The Story of the Weeping Camel” for its detailed depiction of nomadic traditions. Despite somewhat lofty ambitions, “Tulpan” occasionally becomes a kind of romantic comedy when Asa tries to romance the only unmarried woman his age in the immediate vicinity, and she rejects him because his ears are too big. Asa finds himself split between allegiances to family tradition (“No wife, no flock!”) and the possibilities that lie beyond the plain. Another appealing narrative about a sailor with misgivings about his profession, the smart, entertaining and continually involving Australian drama “Three Blind Mice” tells the story of a rabble-rousing trio of young navy men on their last night before shipping out of town. While Sam (Ewen Leslie) evades his colleagues with a newfound lover and laments the navy’s torture method, his two pals (Toby Schmitz and Matthew Newton) aimlessly wander around town, getting drunk and rambling on about their current state of affairs. Newton, the film’s writer-director and one of its stars, succeeds at creating highly distinctive characters with particular desires and reservations, which makes it easy to sympathize with — and enjoy — their inebriated plight. While “Three Blind Mice” deals with men in their early twenties, the Taiwanese high school drama “Winds of September” explores the difficulties of the years preceding that stage of life. Tom Shu-Yu Lin, directing his first feature, does a competent, if somewhat pedestrian, job of depicting a handful of boys hanging out in the weeks leading up to their graduation in 1997. It sounds horribly reductive to look at “Winds of September” as “Freaks and Geeks in China,” but that’s essentially how it reads; although not exactly a comedy, the movie applies a tame wit to the boys’ frequent attempts at causing trouble. Certain scenes, such as the one in which the clique goes skinny dipping in a swimming pool after dark, evoke a sincere feeling of nostalgia rarely on view in today’s popular sarcastic youth films. Of the coming-of-age Discovery quartet, “Rain” appears most likely to find a major audience. Without the suave masculinity of “Three Blind Mice” or the juvenile glee of “Winds of September,” Maria Govan‘s directorial debut announces the arrival of a filmmaker attuned to interpersonal drama. The movie, apparently the first Bahaman film to screen at Toronto, applies a patient, astutely poetic style to the story of a high school girl named Rain (Renel Brown) living with her prostitute mother (Nicki Micheaux) in the small community of Ragged Island in the Bahamas. Guided out of the slums by a kind-hearted physical education instructor (CCH Pounder), Rain learns that her penchant for running places means she’s quite talented at track. With this revelation, “Rain” becomes a high-stakes sports movie. Despite its slow beginning, the film manages to pull you into Rain’s offbeat plight, as she transcends the mundane quality of her current existence and forces the world to acknowledge her ambitions. It’s a story that the luckiest festival films know well.